These cookies use oat flour as the base, which can be used as a gluten free option (be sure to purchase oats labelled gluten free, as regular oats may have cross contamination). Oat flour can be purchased already ground from a bulk foods store, or you can grind your own in a food processor. The addition of coconut sprinkled on top is optional. Preheat oven to 350 degrees F. Spray baking sheets with canola. Add rolled oats to food processor and grind to a flour. Pour oat flour into a bowl and add baking soda. Set aside. In a second mixing bowl, add peanut butter, maple syrup, eggs, and vanilla and mix with a fork. Pour dry ingredients into wet, and fold ingredients together until batter is uniform. Spoon heaping tsp sized dough onto the cookie sheet, allowing for a couple inches space between cookies. 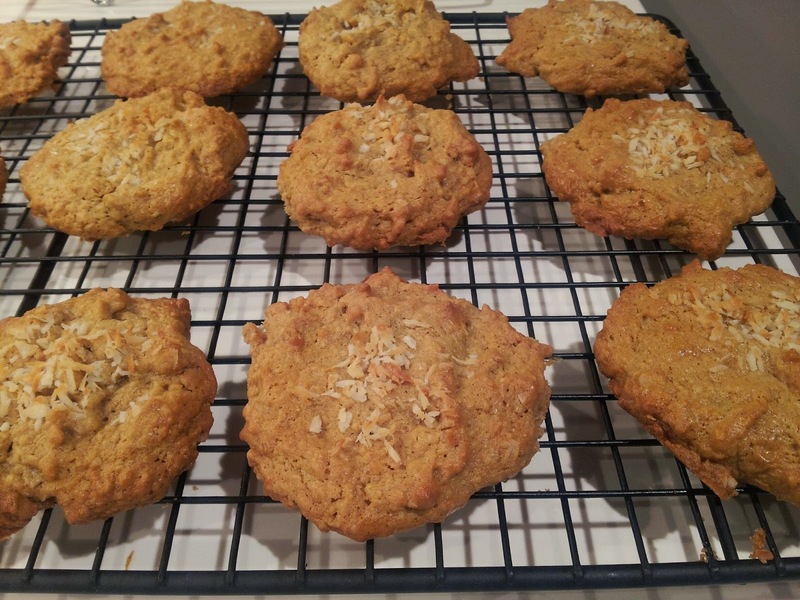 Take a pinch of shredded coconut and sprinkle on top of each cookie. Bake for 8-10 minutes, until lightly browned. Remove from oven and allow to set before moving cookies to a cooling rack.